According to America’s Second Harvest, more than 35 million people are hungry or at risk of going hungry and approximately one in four people in line at the soup kitchen is a child. Campbell Soup Company and the National Association of Letter Carriers (NALC) are teaming up for the 16th annual Stamp Out Hunger! food drive. Here is how you can help feed your fellow Americans. On May 10, Campbell Soup Company will join forces with the National Association of Letter Carriers (NALC) to Stamp Out Hunger! The Stamp Out Hunger! effort is the nation’s largest single-day food drive, having collected more than 836 million pounds of food since its inception in 1993. Do your part to Stamp Out Hunger! To help Stamp Out Hunger! this year, leave a sturdy bag containing non-perishable foods, such as canned soup, canned vegetables, pasta, rice or cereal next to your mailbox prior to the time of regular mail delivery on May 10. Food items should be in non-breakable containers, such as boxes and cans. The nation’s 230,000 letter carriers will then collect donations from homes across America and deliver them to food bank members of America’s Second Harvest, The Nation’s Food Bank Network, and other hunger relief organizations in more than 10,000 local communities. This year, Cambell Soup is donating one million pounds of food to food banks across the country. “An integral part of our corporate mission is to nourish people’s lives everywhere, every day,” says Doug Conant, Campbell’s president and chief executive officer. “Our commitment to the letter carriers and their extraordinary food drive is an important part of our efforts to fulfill this mission and I hope millions of Americans will join us this year to help Stamp Out Hunger! 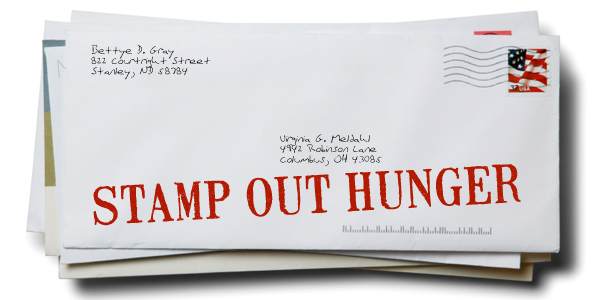 For more information about the Stamp Out Hunger! effort in your community, ask your letter carrier, contact your local post office or visit Help Stamp Out Hunger!.